…even in the Combat Zone. Propaganda for the dominating faction or ads for ‘new and improved’ products are seen everywhere. Everyone hates ‘em, until they need something to hide behind. I’ve been playing around with the idea of building my own billboards for quite some time and had two demands: they should be easy and quick to build, so I could make several of them in a short time. When I cut the plastic troopers out of the sprue, an idea came to mind. Part of the sprue is ideal for the two posts of each billboard, since it has a 90 degree bend. 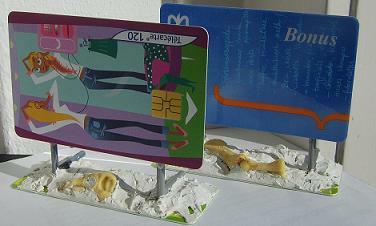 For the billboards and the base I use plastic cards, like bankcards or telephone cards. You’ll also need some (old) washers, nuts or bolts to add some weight to the base so the billboard won’t tip over as easily. First cut out two pieces of L-shaped sprue of equal height. One leg will be the post, while the other leg will be the part that will connect the billboard to the base. This leg doesn’t need to be very long, but certainly shouldn’t be too short either. 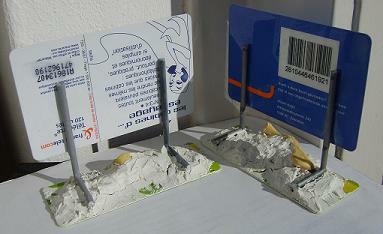 Now use a knife to give both long legs a bit of a flat surface on the front and glue them unto the plastic card. The flat surface will make gluing them unto the card a lot easier. Next, cut out a base of another piece of plasticard and put some washers, nuts or bolts onto it to add weight. Be sure to leave ample room to add the billboard to the base.